Somatics Catalog - Product Report: "#IA2"
THE INTEGRAL ANATOMY SERIES by Gil Hedley, Ph.D. - Vol. 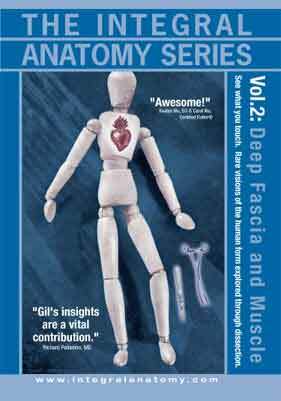 2: Deep Fascia and Muscle. Deep fascia and muscle are shown as whole body layers in their surface and deep projections Muscle is shown in the context of its fascia, and then exposed on camera to enable the viewer to easliy understand vital relationships and connective tissues.  See what you touch. Rare visions of the human form explored through dissection. DVD, color, 110 minutes.